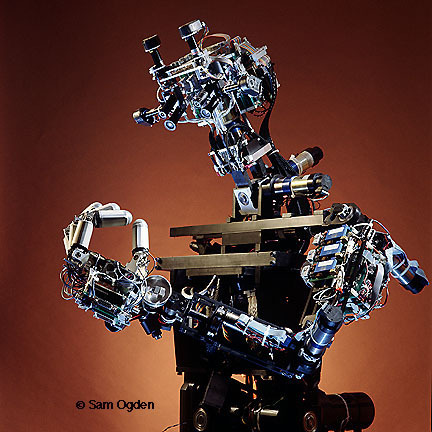 COG, a humanoid robot created by Rodney Brooks and the MIT Artificial Intelligence Lab. 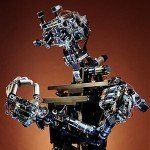 Image credit: Crossroads: The ACM Student Magazine - "The Humanoid Robot Cog"
As our species designation—sapiens—suggests, the defining attribute of human beings is an unparalleled cognitive ability. We think differently from all other creatures on earth, and we can share those thoughts with one another in ways that no other species even approaches. In comparison, the rest of our biology is almost incidental. Hundreds of millions of years of evolution have produced hundreds of thousands of species with brains, and tens of thousands with complex behavioral, perceptual, and learning abilities. Only one of these has ever wondered about its place in the world, because only one evolved the ability to do so. Though we share the same earth with millions of kinds of living creatures, we also live in a world that no other species has access to. We inhabit a world full of abstractions, impossibilities, and paradoxes. We alone brood about what didn’t happen, and spend a large part of each day musing about the way things could have been if events had transpired differently. And we alone ponder what it will be like not to be. In what other species could individuals ever be troubled by the fact that they do not recall the way things were before they were born and will not know what will occur after they die? We tell stories about our real experiences and invent stories about imagined ones, and we even make use of these stories to organize our lives. In a real sense, we live our lives in this shared virtual world. And slowly, over the millenia, we have come to realize that no other species on earth seems able to follow us into this miraculous place. We are all familiar with this facet of our lives, but how, you might ask, could I feel so confident that it is not part of the mental experience of other species—so sure that they do not share these kinds of thoughts and concerns—when they cannot be queried about them? That’s just it! My answer, which will be argued in detail in the following chapters, has everything to do with language and the absence of it in other species. The doorway into this virtual world was opened to us alone by the evolution of language, because language is not merely a mode of communication, it is also the outward expression of an unusual mode of thought—symbolic representation. Without symbolization the entire virtual world that I have described is out of reach: inconceivable. My extravagant claim to know what other species cannot know rests on evidence that symbolic thought does not come innately built in, but develops by internalizing the symbolic process that underlies language. So species that have not acquired the ability to communicate symbolically cannot have acquired the ability to think this way either. — Terrence William Deacon in The Symbolic Species: The co-evolution of language and the brain, (New York: W. W. Norton & Company, 1998), p. 21. First published (New York: W. W. Norton & Company, 1997). Cited in part by Joseph Carroll in his essay “The Adaptive Function of Literature and the Other Arts” published at On the Human, a project of the National Humanities Center. Cited in part by and thanks to @amishare at her Tumblr blog “A Box of Stories”. Posted on behalf of Terrence William Deacon on Thursday, May 27th, 2010 under Quotations.